Among the most frequently asked questions from those who are just getting into snowshoeing is “what’s the best snowshoe size for me?” We can understand why, though. Choosing the right size for your snowshoes can really make the difference. 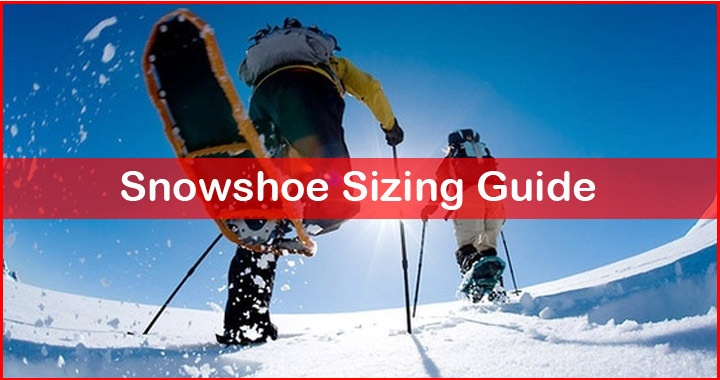 This snowshoe sizing guide will help you with that. The size of your snowshoe determines how well you will “float” above the snow. Snowshoes that are too small can really give you a hard time in powdery situations. They’ll sink a lot into the deep powder and you’ll feel as if you were walking with tons of bricks hanging on your feet. On the other hand, snowshoes that are too big can make it very awkward to walk. It won’t be before the next hour in your trip you’ll get frustrated. Unlike regular footwear, you don’t choose snowshoe size based on how big your foot is. Rather,it’s determined by three main considerations: weight load, terrain conditions, and gender. We’re going to talk about each of them more closely in the following. Do not confuse weight load with your personal body weight. Weight load here refers to the total weight of your body and also anything you stuff into your backpack. Generally speaking, the heavier the weight load is, the larger snowshoes you will need. Most snowshoes are similar in width. They are about 7-8 inches. It is the length that varies. You should choose longer snowshoes if you think you’re going out with a loaded backpack often. However, if you plan on just making a few leisure day hikes in some cross country resorts, you’d better go with the shorter snowshoes . The snowshoe size chart above should help you get a better picture on how big your snowshoes should be. Again, the weight on that chart is the total weight of your body and the stuff you’ll carry. The most common mistake people do when buying their first snowshoes is not minding the terrain they’re going to tackle. You should know that there are many types of snow. You can’t expect a snowshoe (especially the recreational models) to perform the same as well in all snow conditions. Hard pack on machine groomed trails and other heavily traveled paths are better to be covered with shorter snowshoes. Meanwhile, unconsolidated corn, dry fresh powder and deep snow require longer snowshoes. The larger footprint will help with the overall flotation. Some snowshoes with the highest rating in flotation are MSR Lightning Ascent and Tubbs Mountaineer. If you think you’re a petite woman, you may want to consider getting women’s specific snowshoes. Unlike the unisex versions, women’s snowshoes usually feature shorter and slimmer frames with the tails being more tapered. Such design is necessary to accommodate the shorter gaits on many small ladies. Furthermore, the bindings also have smaller fit to match the smaller shoe sizes. Note that not all snowshoes have their women’s specific models. Some are only available in unisex version. Among the best women’s specific snowshoes are Atlas Elektra 12 and Tubbs Wilderness Women’s Snowshoes. The heavier the weight load is, the larger snowshoes you’ll need. The drier the snow is, the longer snowshoes you’ll need to stay afloat. You don’t need to choose women’s specific models unless you have a petite figure. Now that you know the ideal size for you, it’s time to pick out the snowshoes. Check out our top 10 snowshoes of 2017 for better perspective.